Your Dentist Gives 6 Tips for a Healthier Halloween! The time of the year is here to celebrate the fall harvest season with one of the favorite and most festive nights of the year – Halloween. It’s a great way to allow the kid in you to have some fun by indulging in some sweet delights. Your dentist reminds you, though, not to forget about your oral health in the midst of tasting Halloween’s deliciousness. Read on to learn 6 helpful tips to protect your mouth, teeth and gums and prevent oral health issues from arising! Although you’re likely to have a surplus of candy available to eat, practicing some restraint will help to protect your oral health. Instead of eating everything in one day, have your family members spread out the bountiful plenty over a few days or even weeks. You can even freeze the delights for later. Tip #2 – Share the Joy! It’s a way to help other people, who may be experiencing some bumps in life, have some enjoyment. There will be less sugar for your family to consume, which can help to reduce the chances of cavity development. Tip #3 – Timing, Timing, Timing! One of the better times to eat sweet treats is after a meal. That’s because your saliva production is higher immediately after consuming food. Thus, there is a better chance that some of the sugars present from the candy will be flushed away. Bacteria growth is much higher when you sleep, and they love to feed on sugar. Thus, eating candy before bed contributes to a more acidic environment in your mouth that can eventually lead to serious oral health problems like gum disease and reoccurring cavities. To prevent this from happening, stop eating sugary-snacks a couple of hours before bed, and be sure to brush and floss your teeth. Whether you are preparing for bed or your evening is still in progress, it’s imperative to brush and floss your teeth immediately after consuming any candy. The longer the acid-producing sugars are allowed to cling to your teeth, the more bacteria are attracted, creating a caustic environment. Saturating your mouth with water is another way to prevent the ills of tooth decay related to eating candy. Just as your saliva bathes your mouth, so does drinking plenty of water, which will help to remove some of the sticky sugars that cling to your teeth after eating candy. 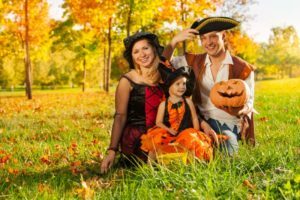 Halloween is a time of fun and provides an opportunity to build lasting memories. By implementing what you’ve learned here, you can enjoy the night and maintain your oral health. For more tips on ways to maximize your oral health on Halloween night and receive preventive care, reach out to your dentist to schedule a visit today! Dr. C.J. Landry earned his dental degree from the LSU School of Dentistry in New Orleans, and for nearly 40 years, he has been a fixture in the Marrero area. To remain current with the latest breakthroughs in the world of dentistry, Dr. Landry has completed thousands of hours of continuing education, which helps him provide his patients with the best care possible at Lapalco Family Dental. To enjoy oral health that can withstand even Halloween night, you can contact Dr. Landry through his website. Comments Off on Your Dentist Gives 6 Tips for a Healthier Halloween!